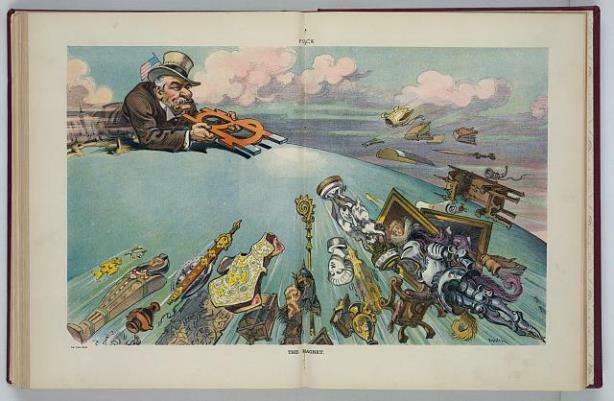 The name John Pierpont Morgan summons up images of the Gilded Age in New York City. Financier to the robber barons, Morgan built a palatial mansion on East 36th Street to house his art collection and library. An attack on the building is the centerpiece of the 1981 film Ragtime and the 1975 novel by E. L. Doctorow that inspired the film. Today, though open to the public as a museum and research center, the Morgan Library still vividly conveys Morgan’s wealth, power, and taste. The company Morgan founded remains a major player in the financial world. J. P. Morgan’s grandfather Joseph left a farm in western Massachusetts to settle in Hartford, where he ran a popular coffee house or tavern. Joseph Morgan later became the proprietor of the City Hotel; invested in real estate, steamboats, and railroads; and helped to found the Aetna Fire Insurance Company. His daughters married good substantial Hartford citizens. His son, Junius Spencer Morgan, became a dry goods merchant with a store on Main Street. In 1836, he married Juliet Pierpont, and on April 17, 1837, their son, John Pierpont Morgan, was born in his grandfather’s house at 26 Asylum Street. Young Pierpont (or Pip, as friends and family called him) attended West Middle School and Cheshire Academy. He played along the Park River with his cousins, James and Francis Goodwin (the sons of his father’s sister, Lucy) with whom he became lifelong friends. Both were successful businessmen and philanthropists; Francis also became an Episcopal minister and served briefly as rector of Trinity Episcopal Church. When Morgan was 14, his family moved from Hartford to Boston, and then on to London, where his father became a partner in George Peabody & Company. After ten years, Junius succeeded Peabody as head of the company, which became J. S. Morgan & Company and developed into one of the leading banks in the world. Young Pierpont Morgan received an education in Europe, at Vevey and then at the university in Göttingen, in Germany. He was an excellent student, and one of his professors at Göttingen urged him to pursue an academic career. But Morgan proved determined to become a banker, a businessman like his father and grandfather. He returned to the United States and went to work for a bank in New York City. By the time he was 24, Morgan was ready to open his own company. J. Pierpont Morgan & Co. prospered, initially due to Morgan’s enduring European connections, but ultimately because of the young man’s business acumen. At the peak of his career, he was one of the richest and most influential men in the United States. He involved himself in the formation of General Electric and the United States Steel Corporation and numerous other industries and railroads. Over the years, J. P. Morgan kept in close touch with his cousins in Hartford. He supported Hartford Hospital and invested in the Hartford Carpet Company, a rug-making firm in Thompsonville, Connecticut. In 1889, concerned about the financial problems of the Wadsworth Atheneum and the museum’s lack of space, Morgan and his cousin Francis Goodwin convinced Morgan’s father Junius to contribute $100,000 to the museum; Morgan himself contributed an additional $50,000. After Junius died in a carriage accident, his son funded a large new addition to the Atheneum. The Morgan Memorial was still under construction when Morgan died in Rome on March 31, 1913, on the way back from a trip to Egypt. 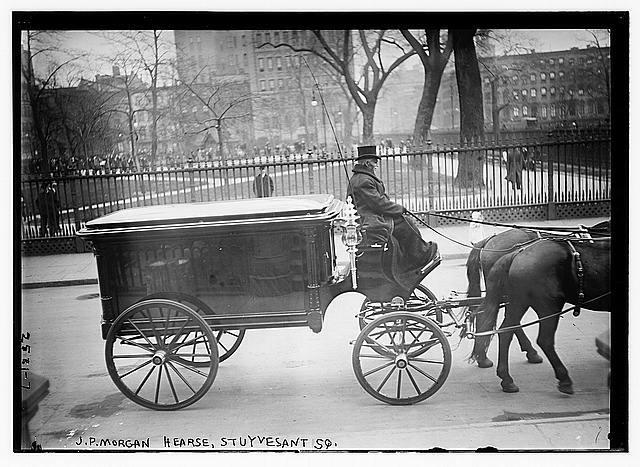 Following a lavish funeral at Saint George’s Church in New York City, the family had J. P. Morgan’s body brought back to Hartford. Crowds lined the streets as the procession left Union Station and proceeded through the city (passing the modest house on Asylum Street where Morgan had been born 75 years earlier) on its way to the Morgan family plot in Cedar Hill Cemetery. In 1917, Morgan’s son gave his father’s collection of ceramics, ivories, and Greek and Roman bronzes to the Wadsworth Atheneum, assuring that J. P. Morgan’s legacy lived on in the city he considered his hometown. “John Pierpont Morgan (1837-1913).” Cedar Hill Cemetery Foundation, 2015. Link. Sinclair, Andrew. Corsair: The Life of J. Pierpont Morgan. Boston, MA: Little, Brown, 1981. Wadsworth Atheneum, and Linda Horvitz Roth. J. Pierpont Morgan, Collector: European Decorative Arts from the Wadsworth Atheneum. Hartford, CT: Wadsworth Atheneum, 1986. Allen, Frederick Lewis. The Great Pierpont Morgan. New York, NY: Harper & Brothers, 1949. Canfield, Cass. 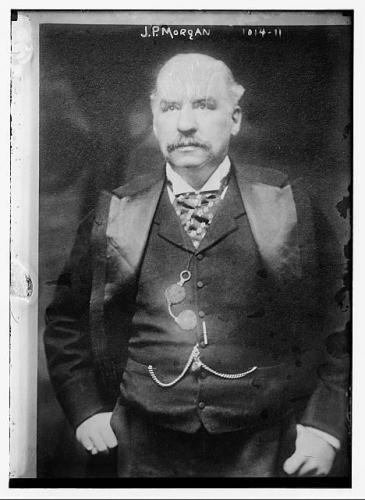 The Incredible Pierpont Morgan; Financier and Art Collector. New York, NY: Harper & Row, 1974.